Oscar Crockett was born in Pecos City, Texas in 1887 to a family that knew cowboying and blacksmithing. His older brother introduced him to bit and spur making and Oscar caught the bug. Crockett spent his early childhood driving cattle and at 23 he rode a train to Kansas City where he got a job working in a blacksmith shop. Early on Oscar made bits and spurs in his spare time before starting a business with George Gliem around 1914. Bits and spurs marked Crockett & Gliem are in collections and are treasured for their rarity. In 1916, Crockett sold his business to C.P. Shipley who was expanding his own production of bits and spurs after a falling out with J.R. McChesney who had previously supplied many of Shipley’s bits and spurs. Crockett helped to set up and run Shipley’s production but quickly had a falling out and after Oscar quit he packed up and moved to Pawhuska, Oklahoma. Oscar ran his own blacksmith for about a year before shutting it down to help in the war effort. After WWI Crockett was able to get financing from his uncle and purchased Shipley’s bit and spur department and opened up Crockett Bit and Spur Company in 1920 in Kansas City. Crockett Bit & Spur grew quickly and grew to the point where they employed many craftsmen to help fill orders that were pouring in. In 1932 Oscar moved the company and factory to his new home in Lenexa, Kansas where it did well until the start of WWII when many of his workers left for the war. In 1943 Oscar moved the company to Boulder, Colorado with 10 workers during WWII and rebuilt the company as he was able to hire new workers. The Crockett Bit and Spur Company reportedly had as many as 125 workers in Boulder by the late 40’s when they were using mechanical means to mass produce many of their bits and spurs. In 1948, Oscar moved back to his Kansas farm and let his employees run the factory without much of his own oversight. He was traveling back to visit Boulder in 1949 when he died from a heart attack. Oscar’s wife Hazel continued to operate the company until 1951 when she sold it to James Renalde. 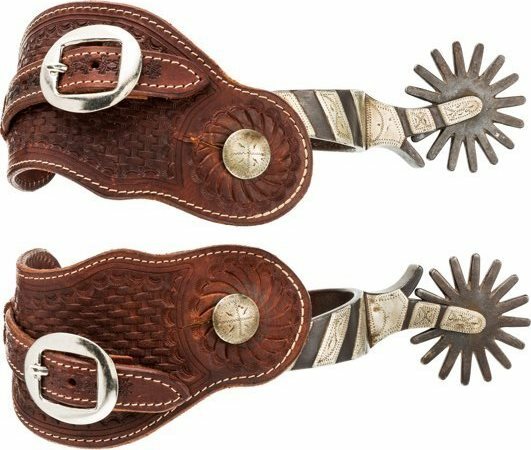 The company continued to produce bits and spurs marked “CROCKETT” into the 60’s but it was rebranded as Crockett-Renalde, which was later Crockett, Kelly, Renalde, and eventually was closed and liquidated in the 1980s. Bits and spurs that were handmade by Oscar Crockett himself are the most desirable to collectors and Crockett used different maker’s marks for most of his production so it’s possible to date and identify his spurs by the type of mark, size of mark and location of the maker’s mark present on Crockett spurs. Items from his middle to late period where the company was mass producing bits and spurs with little or no oversight from Crockett himself will not be nearly as valuable as bits and spurs that Crockett crafted himself, or that were still hand made and date to his early period prior to 1935. For help identifying, dating, or appraising your Crockett Bit or Spurs, please Contact Us. Click here for information on Crockett Maker’s Marks.